211 Bernard: Kids Day with Sheila Heti this afternoon! Kids Day with Sheila Heti this afternoon! Don't forget! Today, Sunday at 2pm, we are hosting a very special kids day! Join us for an afternoon of juice, cookies, and story readings, this time with the wonderful Sheila Heti. 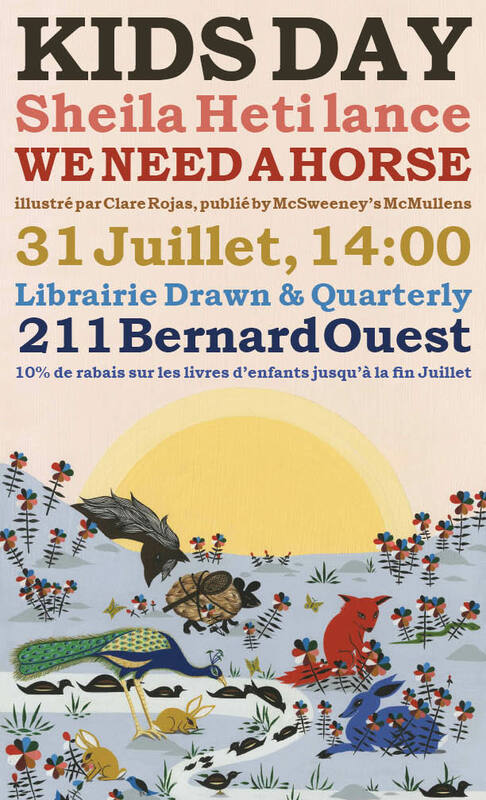 We will be launching We Need a Horse, a kids book written by Sheila and painted by the wonderful Clare Rojas. It's about a speckled horse who is trying to figure out why he was made a horse, with some help from a sassy tennis-playing sheep and a talking apple. This book is one of the first four from McSweeney’s McMullens, McSweeney's new children’s imprint which strives to remind readers of just how delightful it can be to sit down and read a book. Sheila will be reading from the book, presenting a slideshow, and answering questions like "How can a sheep play tennis if sheep don't have hands?"